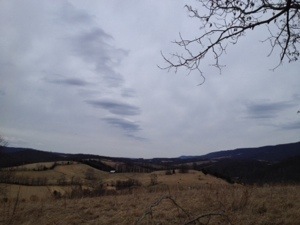 Niday Shelter, Va. AT mile 681.5, Sunday March 16 — yesterday the high temp was 60F. Today it isn’t. The morning opened with a leaden sky. Sleet on the menu for dinner. 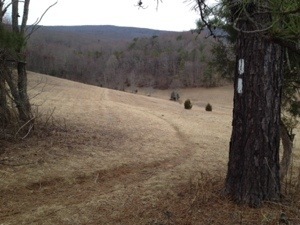 As things generally go on the AT, it didn’t quite happen that way. I slept in until 8. Why not? The overnight temp was 40 F. All good for a leisurely start. Only 12.4 miles to my objective. Plus it was up and over only one mountain. Piece of cake, right? The early terrain was picturesque, but the skies foretold the future. 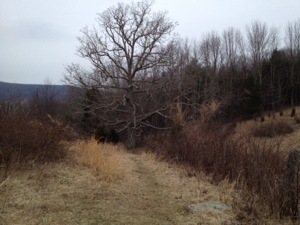 Today’s trail candy was the Keffer Oak. 18 feet in circumference and more than 300 years old, it’s the largest white oak south of the Mason-Dixon Line, according to my trail guide. After that, a brisk climb to where the trail followed the leading edge of a thrust fault. Que the snow, except it was 1:30 pm, a bit early. I dropped my pack and jerked on my rain jacket and ski hat. Did I mention that the rocks started to glaze over after about an hour? Not good. A fall could easily end this epic adventure. Fortunately all was well. Niday Shelter appeared around 4:30 pm on schedule. I startled the dickens out of a 44-year-old southbound section hiker who happened to be encamped inside the shelter cocooned in her tent. Didn’t mean it. Meanwhile the light snow is forecast to continue all day tomorrow. 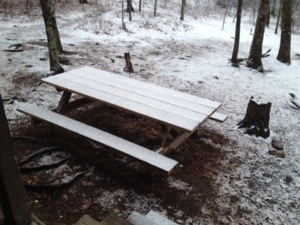 Just now our shelter picnic table is finely dusted with a bit of White Christmas. I have a long hard day tomorrow to make Dragon’s tooth on time to meet my friend Val. I’m sure her young boys will be very interested in my gear.